Published in Life & Health on 10/16/2017 by Harry Lew, Chief Content Writer. Have you ever gotten into a “great debate” with a client or colleague about what form of life insurance is best . . . term or whole life? Then you no doubt noticed how hard it is to win this argument. That’s because in matters such as these, loyalty to dogma becomes more important than clarity of facts. This makes it hard for agents and customers to think clearly about—and decide on—which life insurance type works best in a given situation. But it does make for lively cocktail-party chatter and heated arguments on financial talk radio. But as a life insurance agent, at some point you have to move beyond debate and into actually selling life insurance. As we mentioned in Part 1 of this series, the way to do that is to be fact-driven—to know the facts about each product type, pure facts stripped of bias. Then determine the facts regarding client needs. Finally, apply the appropriate product type to a client’s specific need. Experts agree this is the wisest and safest way to sell life insurance, especially when it comes to avoiding future errors & omissions insurance claims. In Part 1 of this series, we presenting the basic facts about term life insurance: what it is, what it isn’t, what are its main features, what are the advantages and disadvantages of recommending it, and under what situations and for what types of prospects should you recommend its purchase. In this article, we’ll do the same for whole life. Ready? 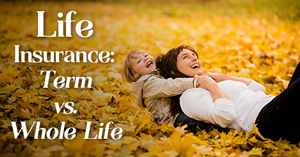 Whole life insurance is a form of life insurance that protects a client over the person’s total life. “Whole life” typically refers to the oldest and most frequently sold type of life insurance, ordinary level premium whole life. It’s also known as ordinary life, straight life, traditional whole life, or continuous premium whole life. Whatever you call it, the key point about whole life is that the policyowner benefits from life-long coverage, and that the product’s level-premium design generates higher premiums than with a term offering in order make life-long protection affordable. Otherwise, at the older ages, a term premium would be insufficient to cover an elderly insured’s true mortality cost as their risk of dying grew over time. Whole life isn’t a form of temporary or term protection; i.e., its coverage doesn’t automatically end after its term expires. It also doesn’t charge increasing premiums over time as the insured ages. Nor does it offer only mortality protection like term insurance does. In addition to providing pure death insurance, it provides an array of living benefits that can play an important role for certain prospects. What Are Whole Life’s Features? Whole life’s major feature is that it offers permanent death protection that lasts the policyowner’s entire life. Its premiums generally remain the same, although they likely will be higher than for a term life policy. Also, unlike term insurance, whole life accumulates cash values, which allow it to fund the escalating difference between the client’s mortality risk and the level premium, along with a pool of money that can be withdrawn or borrowed against. Finally, whole life insurance policies might be eligible for the payment of annual dividends. What are Whole Life’s Advantages? As already mentioned, a fixed and known annual premium. However with so-called participating whole life policies (those that pay dividends), the net premiums (fixed premiums minus dividends) generally decrease over time. A guaranteed ceiling on what insurers charge for mortality costs (what it costs them to provide the death protection) and for other expense items. They also feature a guaranteed minimum amount of interest credits to the cash value. The growth in whole life’s savings component (in the form of interest or earnings) is tax-free or tax deferred depending on whether the gains are taken at death (tax-free) or during the policy owner’s lifetime (tax-deferred). The ability to pay higher effective interest on cash values than is generally available through tax-free municipal bonds. This is due to the policies cash values and dividend-payment mechanism. Less risk than longer-term municipal bonds and other fixed-income investments, since cash values are insulated from market risk. The ability to access cash values through low net-cost policy loans. Although there is a charge for this feature, cash values will continue to increase as the insurer credits at least the minimum guaranteed interest as defined in the policy. Protection of the death benefit proceeds from estate taxes as long as the policy beneficiary is not the policyowner’s estate. The same holds true for state inheritance taxes. No public record of the death benefit payment or to whom it is paid. Freedom of the death benefit from federal income tax liability under most scenarios. Exemption of death benefit payment, either fully or partially, from state inheritance taxes as long as the proceeds aren’t made to the estate. The ability to use a life insurance policy to secure a personal loan. What Are Whole Life’s Disadvantages? Any lifetime gains experienced inside a whole life policy’s cash value will be subject to income taxation. Whole life is not the most economical form of life insurance if lowest premium is the main client consideration. The ratio of death benefit to premium is lower in the early years of the policy with whole life vs. term. The reverse is true in the future when term life premiums begin to rise. Surrendering a whole life policy early in a client’s lifespan, say within the first five to 10 years, can be an issue because the insurer will need to recover sales commissions and initial policy expenses from the cash value. Policy loan interest expenses are not deductible from federal income taxes. A non-participating (i.e., one that doesn’t pay dividends) whole life insurance policy will provide little inflation protection. However, a participating whole life policy will, since its dividends represent the positive mortality, investment, and business expense control of the life insurer. The cash value’s rate of return for ordinary life policy does not always perform well pre-tax against alternative investments. However, when principal safety, guaranteed liquidity, and term life cost are considered, whole life often does quite well. Who Is Whole Life for? Their personal preferences, prejudices, and priorities. How much insurance they need. How long they need insurance for. What their cash-flow considerations are. They’d rather own their insurance than rent it. They want something to show for their long-term premium outlay. They can afford to pay for sufficient life insurance to cover their entire death need AND have more resources left over that can go toward permanent whole life. They have a death protection need that will last between 10 and 15 years (offer some combination of term and whole life). Their death benefit need will last 15 years or longer (offer whole life). Their need for a death benefit will last until they are age 55 or longer (offer whole life). They have a buy-sell need within a business context (offer whole life). There’s a need to generate funds to cover estate taxes, to transfer money between generations, or to replace money given to charities or diverted for other reasons (offer whole life). They have a desire to pay for their coverage in advance (i.e., prepay it) because they expect to have a long life (buy vanishing premium or limited pay whole life). In short, here’s the bottom line on this form of life insurance, which is exactly the same as it was for term insurance. The product isn’t inherently good or bad. It becomes so only when matched to a client. This is why it’s crucial to understand the facts about whole life insurance and the facts surrounding the prospect. Only then can you match the right product type to the client situation. If people have a life-long need for death protection and have the ability to pay for it, whole life insurance is generally an appropriate solution.